Dear, Brothers and Sisters of the US military. All Wars Are Bankers Wars! This article is not written to hurt you, but to help you chose – America – or – The Corporation. The United States of American in 1933 went bankruptcy - for more see page 1. Out of that 1933 illegal bankruptcy America became a corporation. That Corporation is called THE UNITED STATES OF AMERICA INCORPORATED all Capital Letters and is owned by eight mostly foreign Jewish Banking families - for more see page 7. The eight mostly foreign Jewish Banking families also own the Federal Reserve Corporation, but here is the trump card. The Jewish Bankers are owned or controlled by a much larger Jewish Corporation for more see page 6. The solder who volunteers to kill or work forTHE UNITED STATES OF AMERICA the Corporation becomes a Corporation themselves - for more see page 2. You become a paid corporate mercenary for THE UNITED STATES OF AMERICA the Corporation. The Bankers can lease or rent you as a Corporation out to any country they want. It is all about money to a Banker. That’s business, just business. They put a Gold Fringe Flag - for more see page 3, patch on your shoulder. Those Gold Fringe Flag Patches stands for no Nation and no Constitution. The Gold Fringe does not set the rules of war, but is a warning sign - wear it at your own risk. You are a paid Corporation working for the Corporation and you are under Admiralty Military Law, not constitutional law, or common law, or civil law, or statute law. You have become a hired mercenary for a Corporation not to protect America or your love ones. It is for the personal greed and gain of the mostly foreign Jesuit and Jewish Bankers. In the end the greedy and power hungry Jesuit / Jewish Bankers and their owners always get it all. I say to all that reads this. Stop volunteering to give your life, blood and body parts for mostly foreign Bankers. Let’s stop the killing of people who don’t even know where America is. They have no way to ever come here to hurt America or us. 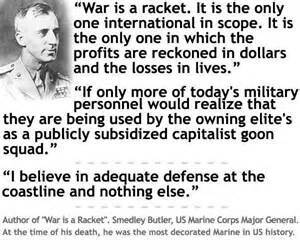 War is a racket for profit - for more see page 32. Why can’t the people of America ask our military solders to change sides and work for the America people not the illegal Corporation? Then all Americans could work together side by side to reestablish the old United States of America and take back the land and all of it assets the Bankers illegally took from us in 1933. America is the land we all love. Let’s stand beside her and guide her to that great nation America is meant to be. This is the land of the brave and the home of the free. All of us must be brave to be free. Solder stay safe. Come home soon to help us save America from the Banker elite and their New World Order. for more see page 33. I am not a lawyer and may have not said it all as correctly as it could have been said. I am not a paid professional writer, so it may not have been written as well as it could have been. What I am is an American who was drafted and served time in Korea for THE UNITED STATES OF AMERICA the Corporation. This article is true as I understand it, what do you want for America? You may ask. What I want for America, is to be back in the hands of real Americans, not groups with dual citizenship and loyal to whom? - for more see page 9. What I want for America is not to be ruled by secret societies with special handshakes and special favors for their societies or their religious order. What I want for America is to be run in a way that the world does not hate America or its people. What I don’t want is to live in a country where you have to fear a Corporation owned by foreign Bankers and others. I want to live in a nation where we all can enjoy the freedom to be a sovereign free people - for more see page 10. I want to live where people work and don’t live off others or the system. Isn't that what all true Blue Americans also want? 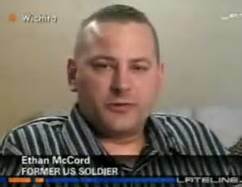 Solder, we Americans are here waiting for your help and your safe return. Please come home soon - Yours in Freedom and Honor. Open The Links Below To See What The US Corporation You Work For Thinks Of You!!! Let Us By Standing Together Show The Blood Lines That Rule This World Just Who We Americans Are!!! "Solder will you shoot Americans?" ​America MUST SEE Get ready! ​A soldier speaks out... "no soldiers, no war." What do they know that is causing that?